The judge found me guilty of one sleeping ticket. The article is illustrated with scans of Linda Lemasters’ article that appeared in Street Spirit. In case the Indybay article linked above should disappear (and this has been known to happen) the text of the IndyBay article is transcribed below. Also, click the images below for pdfs of the Street Spirit article. Homeless blogger and medical marijuana patient Craig Canada thought he’d won a historic victory in the Santa Cruz Superior court of Judge Denine Guy when she found him not guilty of “sleeping outside” because of his need to use medical marijuana. Two months later she reversed herself without explanation. Who got to her? 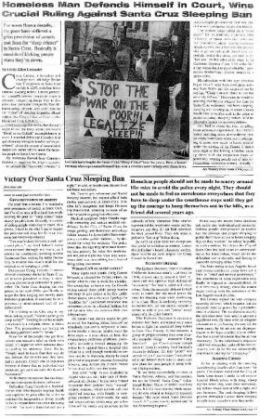 Craig Canada won we had thought was a historic victory in the Santa Cruz courts this summer around the Sleeping Ban. Judge Denine Guy of Department One found him not guilty on four charges of illegal sleeping (sleeping on public property after 11 PM at night) because Canada was a medical marijuana user. Linda Lemaster testified for him as head of the former Homeless Issues Task Force. Their final report. Lemaster wrote a lengthy article on the subject for the August 2007 issue of Street Spirit [reprinted below]. I was present in court throughout that trial, along with attorney Kate Wells (not representing him), and other activists from HUFF [Homeless United for Friendship & Freedom] and HRO (the Human Rights Organization). Canada represented himself, though it appeared to be his first criminal trial. Rather than appoint an attorney to help Canada, who is psychologically disabled, Guy quickly determined that all six elements of the necessity defense were met, and found Canada not guilty. The point was that no emergency shelter services allow patients who need to medicate with medical marijuana. In Santa Cruz, the only walk-in emergency shelter service is the Interfaith Satellite Shelter Service at the Homeless Services Center. It only has space (spring, summer, and fall) for 40 of Santa Cruz’s 1500-2000 homeless people anyway, but no space at any time for medical marijuana users, even with a county-approved marijuana card. So Guy, a relatively new judge in Department 1, found Canada “not guilty” and also indicated that there was a procedure for having such citations dismissed downstairs, where they initially appear. I’ve been encouraging people to disqualify Commissioner Kim Baskett downstairs because, in spite of some improvements, she still appears to me to be clearly prejudiced in favor of police agencies. To disqualify her, simply write out a page to give to the window in the basement for traffic infractions in the County Building at 701 Ocean St. Address it to “To Whom This May Concern”, and cite your citation or case number, and the date. State something like “I believe Commissioner Kim Baskett to be prejudiced and move to disqualify her under 170.6 CCP and have my case moved to another court.” Ask for a date-stamped copy of your motion. The clerk should immediately give you a court date in either Departments 1 or 2 upstairs. However recently Baskett has been dismissing camping tickets at arraignment, eliminating the need to move the case to a higher court. IF you bring a letter from the Homeless Services Center stating what Baskett already knows–that there was no shelter for homeless people on the night in question. You can usually get such a letter from the staff of the HSC out at 115 Coral St. during business hours of the week. When I spoke to one of the workers, Tia, out there, she seemed ambivalent when I asked her if she was willing to give out more than one letter (for, say, more than one night of “illegal” sleeping). She seemed to agree that she or Miguel Banuelos would. Please report any problems in getting such letters to HUFF at 423-4833. The city attorney’s office and SCPD nonetheless continued to harass Canada and moved to prosecute him for two more sleepcrime citations, even though Guy had thrown out the four mentioned above. Canada disqualified Baskett from the two sleeping ban tickets and sent them up to Judge Guy’s court for trial in September. I had to go to court again Friday for sleeping tickets. One ticket was dismissed when the issuing officer didn’t show. I was required to prove my innocence, that there was no legal alternative, on the other. The judge refused to accept that the ticket was before July 6th, when I was found not-guilty of four tickets per The Necessity Defense. I was the last case, and was in court until it closed at 4:30pm. The judge asked me what had happened in the mean time, and if I had made any attempts to get housing. I related the various events, including that my mother had emailed everyone she could think of and got responses from the city manager and Page Smith, among others. The City Manager’s office was surprised their social services refused housing and services to medical marijuana patients (after all I’ve gone through to raise the issue) but that since the contract for services from the county it isn’t their jurisdiction. Page Smith who refused me housing twice, told my mother I could get on their list… …which I never did. ….The judge called Page Smith, and continued the trial until Tuesday. I assume the verdict will be based on what Page Smith says, and whether or not I can present evidence that I had no legal alternative. I expect to be found guilty because I didn’t spend every waking moment applying for housing. The judge also asked me about my finances, and my credit. I had my mail with me and my credit card statements and told her I was $7,000 in debt, mostly from buying motel rooms to sleep legally. I what I thought was a confirmation for a ‘pre-application’ for housing turned out to be an application for housing in another county, in Hollister and San Juan Bapista, a different county. From the Santa Cruz housing authority. I hadn’t actually looked at the application, and the judge asked me to read it, and when I realized it was in another county I said, “They might as well send me to Nazi Germany”. Canada, Bernard Klitzner, and I showed up for the continued 1:30 trial in Guy’s Courtroom One on Tuesday September 25th. Craig Canada was not on the afternoon calendar posted outside the courtroom. The strike of county court workers had just ended. Judge Guy was nowhere to be found and the courtroom was locked. Ill and late for a doctor’s appointment, Linda Lemaster showed up to present her testimony (again–the same testimony as before), but on finding the court closed, she returned to her car to head for a 2 PM appointment. I went outside with her to find her some copies of Street Spirit. 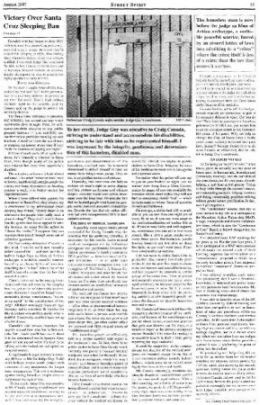 During that period of time, Judge Guy apparently appeared, insisted Canada go to trial though he wasn’t on the calendar and didn’t have his witnesses with him. She reported no further contact with Page Smith community house and demanded his documentation again proving a “psychiatric disability”. Canada told her he’d presented all that evidence at the last trial in her court and assumed it wouldn’t be necessary to bring it in again, since she had seen and approved it then, and nothing had changed. Guy refused to wait for Canada’s witnesses and dismissed his arguments. In an abrupt and curious turnaround, she found him guilty of sleeping, even though she’d found no place where Canada could legally go for emergency shelter that would accept a medical marijuana patient. She didn’t indicate she’d received any new evidence of shelter being granted for medical marijuana patients in any of the city/county homeless programs (whether the ISSP, Page Smith Community House, the River St. Shelter, the Rebele Family Shelter, or anywhere else). Nor did she clarify why this current sleepticket was any different than the four previous ones she’d dismissed. According to what I can piece together, she did not allow Canada to present the necessity defense as before–even though the same restrictive conditions were true. (More restrictive in fact, in that some of the earlier tickets were given out during the winter when there were–in theory 160 spaces for the nearly two thousand homeless; the ticket she found him guilty for was given him in May when there were only 40 spaces. Canada replied that he’d done nothing wrong, that he would refuse to pay the $95 fine ($20 is what it is on the books plus $75 in court fees). Guy offered to reduce the fine to $20 total, then to $15. Canada insisted that he was not guilty and suggested she could jail him if she needed to. She left the court, setting a December date for payment of the $15, leaving witness Bernard Klitzner outraged and dumbfounded. “Someone must have gotten to her”, was Klitzner’s only explanation. Some of us are workign to prepare a complaint to the Commission on Judicial Performance against Judge Guy for what seems like inexplicable abuse of process and succumbing to possible political pressure. Craig Canada is a homeless medical marijuana patient who’s been in Santa Cruz for several years. You may have seen him on Pacific Avenue. He medicates regularly and maintains an extensive website on marijuana and the drug war. He also has an excellent streetblog http://www.palmspringsbum.com/blog/ where he talks about his own run-in‘s with police, security guards, and poverty bureaucrats. Canada has faced harassment from the police for medicating (legally) on Pacific Avenue. He regularly deals with hostility from the on-line Santa Cruz Sentinel forum, the boot from Homeless Services, and a mixed reaction from the courts. Canada discusses a recent incident of middle-of-the-night First Alarm Security guard harassment for sitting on a bench outside the library in the wee hours of the morning using his computer. “Rot in Hell”. Canada is can also be heard on the archives of Bathrobespierre’s Broadsides, found on the HUFF website at http://www.huffsantacruz.org (click on “New: Descriptions of Bathrobespierre’s Broadsides radio shows from August 2005” and search for “Craig Canada”). For those who’ve suffered harassment from the SCPD for medical marijuana or for recreational marijuana on private property (now supposed to be the lowest priority of enforcement under Measure K), check out the Measure K Commission meeting, coming up next Monday September 8 6 PM at City Hall Chambers. Contact Anita Henri at 425-3444 or e-mail her at medex95060 [at] aol.com for more info. The Measure K Commission, castrated by a deal between the City Attorney and attorney Ben Rice (allowing police to duck giving out monthly stats on their marijuana busts), has only half its members appointed, after nearly a year of Council dithering. Call Council at 420-5020 to demand Robinson, Madrigal, and Porter stop stonewalling and make their appointments. Contact Craig Canada at craig.canada@palmspringsbum.com. Write up and report an incidents you witness of harassment against poor people outside. Contact 423-4833 to keep me informed. A copy of this story (all three parts) is available through HUFF for use as a flyer. Contact us at 423-4833. A copy of the August 2007 Street Spirit is available at the Santa Cruz Public Library, Main Branch, in the reference section.